By increasing the stiffness of the vehicle, it has been possible to realize a countless number of benefits for steering stability, and in order that it would be possible to achieve said increase in stiffness, we at Spoon have developed this tower-bar product. 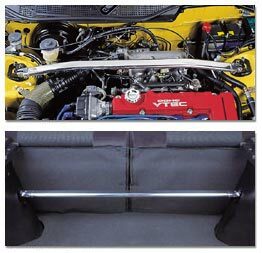 In the front of the vehicle, this is joined on both left and right to the top of the damper in the engine compartment, thus preventing deflection of the frame, optimizing the handling benefits achieved through increased stiffness, and allowing a more direct-type steering characteristic to be realized. Installation can be completed easily and simply involves moving the air-conditioner hose by a slight degree. In the rear also, this component is joined on both the left and right to the top of the trunk compartment's damper, thus increasing stiffness and preventing creaking and warping of the vehicle body. When assembled, the steering behavior changes to show an under-steering characteristic, and when this assembly is carried out on an EG or EK, it will be necessary to slightly modify the internal lining using a cutter knife.